Are you already peeved at the forever long title? I’m trying not to totally lose my face over these burritos. It’s not even really the burritos, though. It’s the SAUCE. It’s that illegally delicious creamy roasted poblano garlic SAUCE. Hi, try six cloves of roasted garlic. You’ll just take six cloves of garlic, still in their skins, and pop them under the broiler for two minutes. Maybe a little drizzle of olive oil on them. The oil will sizzle and sputter, the skins will quickly darken in spots, and that’s it! You’ll set the cloves aside with the roasted peppers, and about ten minutes later, those toasty fragrant cloves will slide right out of their skins, in flawless roasted form. I’m telling you, this sauce will have you seeing starrrrrrrs, my friend. Let’s talk about the chicken. Heavenly frickin’ day. I found some ancho chile powder at a local spice boutique, and holy cow is it ever wonderful. It’s different from traditional chile powder. A bit warmer and fruitier in flavor, yet just a ting of smoke. I dig it. If you can find it, use it! If not, regulah ol’ chile powder’ll dew juz fahn. The ancho-kissed chicken is simply seared and chopped up. Paired with creamy chunks of avocado and shredded pepper jack cheese, and you’ve got yourself one ding dang heck of a burrito filling. I decided to bake these burritos because I would never be able to live with myself without an extra totally necessary heaping mound of melted cheese on top. I’m sure you can understand. And of course the finishing spoonful (or fifty) of that warmed, creamy, zingy, sorry-not-sorry sauce. Will you punch me in the face if I say YOLO? Turn your oven to broil. Place the peppers on a baking sheet and broil until charred and black all over, turning to blacken all sides. Remove from the baking sheet and place in a small bowl; cover with plastic wrap. Place the garlic cloves on the sheet, drizzle with a tsp of olive oil and broil for about two minutes, or until the skins start to get dark in spots. Add the garlic to the pepper bowl. Cover and let rest for 10 minutes. Season the chicken on both sides with salt, pepper and the ancho chile powder. Sauté in a medium skillet, in a little bit of oil, until browned on both sides and cooked through, about 9 minutes total. Cover chicken and let rest for about 10 minutes. Once rested, give it a good chop. Remove the skins, stems and seeds from the peppers, and the garlic skins. Place them in a large processor, and add the heavy cream, cilantro and lime juice. Add a small pinch of salt to the mix, and pulse until smooth and creamy. Transfer sauce to a small saucepan and simmer on low. In the meantime, preheat your oven to 375. Place the tortillas on the baking sheet. Divide the chopped chicken among the tortillas and top with diced avocado and half the shredded cheese. Roll the burritos up and place them on the sheet, seam-side down. Top with the remaining cheese, and bake for 15 minutes, or until the cheese is browned and bubbly. 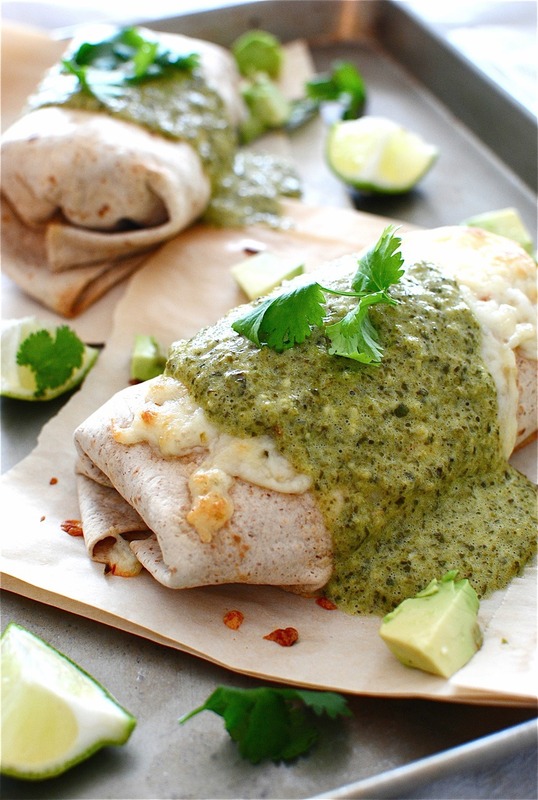 Spoon the creamy poblano sauce over each burrito and serve immediately with lime wedges. That is, if you can even make it out of the kitchen alive. *there will probably be some sauce leftover, which is the greatest thing in life. Drizzle it over your eggs in the morning! 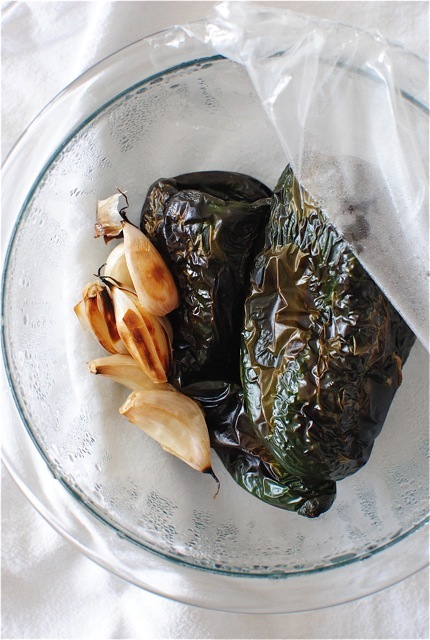 *you could always use regular chile powder if you can’t find ancho. *sub milk if you’re not into cream! Wait, you’re seriously not into cream? I’ll think I’ll go drink the leftover sauce now. Ugh. I just played volleyball (so I'm basically starving) and there is nearly zero food in my apartment and I want to eat these immediately. I'm only peeved this recipe didn't include sausage. Seriously though I want to put that sauce on everything. I need these in my life immediately. I know my husband will hate them (he's hella picky... I know, how could I marry someone who doesn't like all foods? But he has other amazing qualities I swear! ), so I'm trying to figure out a nice way to say "I don't care because I'm making these tonight." Not too harsh right?! ...dew juz fahn. Love you girl! Your recipes are my all time favorite. I don't know how you do it, but they just make me drool an obscene amount. This one. Oh man, I can not wait to make it. YAH YAH YAH that sauce! This looks SO amazing. I am grocery shopping today and those poblanos are on my list! Haha I always struggle with long recipe titles. I try to shorten them but don't want to leave out anything that deserves the spotlight! 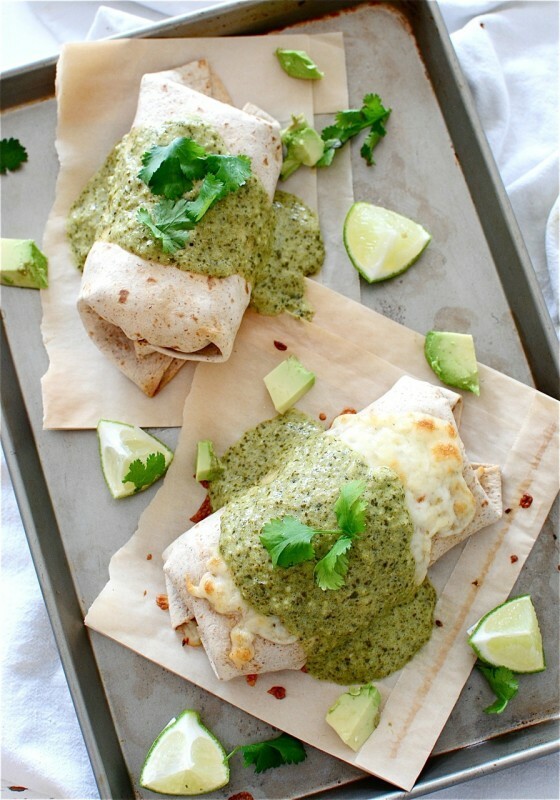 Such as in these awesome looking burritos. Oh holy mother that is all good and pure in this world. I WANT. Bev, I just had to comment because, I'm hello! My mouth started drooling when I read the title. And THEN I saw the photos...waterworks! Making.them.asap. 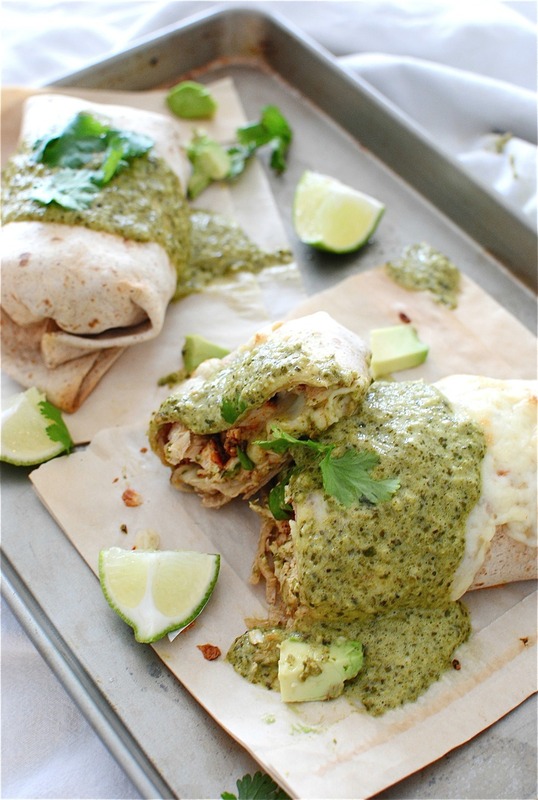 Baked burrito. Who knew? 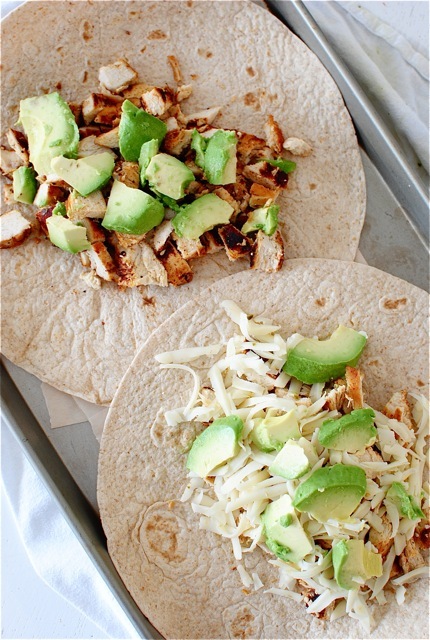 Hi...just made them for dinner tonight( minus the burrito wrap...dumb low-carb diet). The sauce is amazing! I severed it over the chicken with melted jack cheese. Wow! Thanks for a great recipe. Made this tonight and was so yummy! 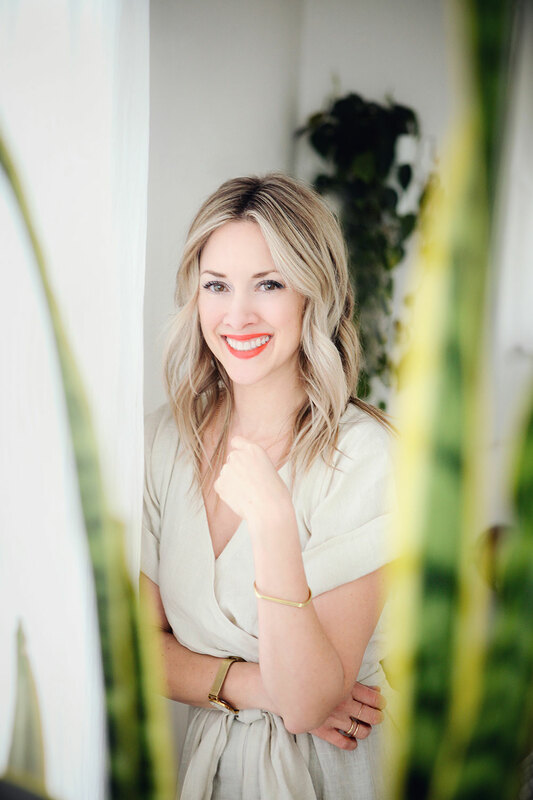 :) I think I will add some refried beans to the burritos though, I felt like there was something missing.......I love your website and make tons of your recipes for dinner! Refried beans are suuuuch a good idea. I didn't add much to the filling since I tend to go overboard with cheese and sauces. :) But add away! 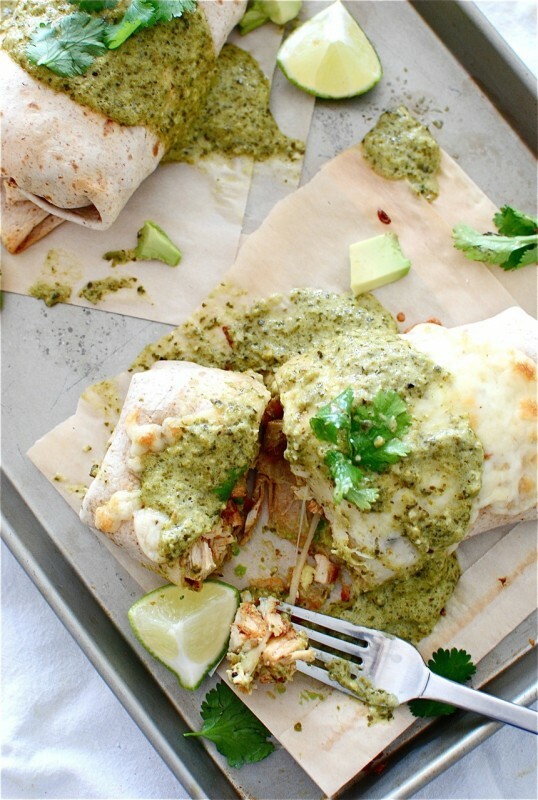 Oh my ... I`ll definitely make this for dinner tonight. Thank you !